A mathematical billiard is a mechanical system consisting of a billiard ball on a table of any form (which can be planar or even a multidimensional domain) but without billiard pockets. The ball moves and its trajectory is defined by the ball's initial position and its initial speed vector. The ball's reflections from the boundary of the table are assumed to have the property that the reflection and incidence angles are the same. 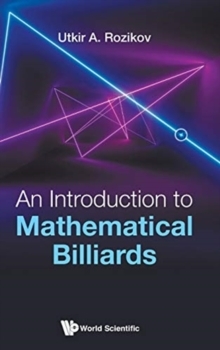 This book comprehensively presents known results on the behavior of a trajectory of a billiard ball on a planar table (having one of the following forms: circle, ellipse, triangle, rectangle, polygon and some general convex domains). It provides a systematic review of the theory of dynamical systems, with a concise presentation of billiards in elementary mathematics and simple billiards related to geometry and physics.The description of these trajectories leads to the solution of various questions in mathematics and mechanics: problems related to liquid transfusion, lighting of mirror rooms, crushing of stones in a kidney, collisions of gas particles, etc. The analysis of billiard trajectories can involve methods of geometry, dynamical systems, and ergodic theory, as well as methods of theoretical physics and mechanics, which has applications in the fields of biology, mathematics, medicine, and physics.